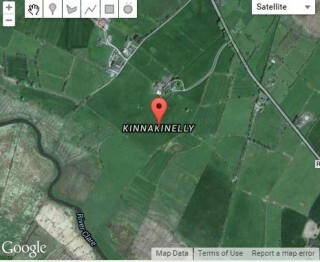 There is a church and children’s burial ground in Kinnakinelly. There is a very poorly preserved rectangular church located on a low hill in gently undulating grassland overlooking bog land to the south. The grassed-over foundation is all that survived. There I a gap in the north wall that may possibly mark the site of a doorway. A children’s burial ground lies to the south and west. There is a sub-rectangular area to the south and west of the church. It is defined by a scrap along the south side, a field wall to the west and north along the church. There are numerous set stones that indicate graves orientated north – south. There is a inscribed rectangular undated grave slap close to the northeast corner.